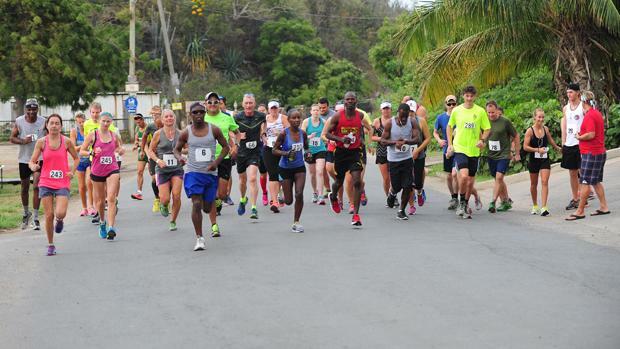 TORTOLA-Reuben Stoby and Maria Mays were the top male and female finishers in Saturday's Dive BVI 10k Series finale-the final tune up for the 5th annual Virgin Gorda Half Marathon and Six Miles Challenge on May 14. "I think my time is pretty decent," said Stoby who had Guy Williamson breathing down his neck last year when he ran 40:19 and Williamson, 40:59. "But, I'm happy with the time ahead of the Half Marathon. Stoby who ran 46:14 over the first half of the course-including the first six miles up to Nail Bay two weeks ago-said both races were important in his preparations for the May 14 race. "Definitely, to re-familiarize yourself with the course as I did last year as well, but, thanks to the 5k series as well, that has been helping me to get in shape as well," he noted. "But, it hasn't been anything too special leading up to the Half Marathon." Mays said that in the first tune up on April 11, she was looking at it as preparation for the Tortola Torture and not the Virgin Gorda Half Marathon and six Miles Challenge. "That was the big scary thing in the way that I couldn't see past, but this race today, like Reuben said, it was great to see the course again," she said. "It's just fantastic coming to Virgin Gorda. It's three or so weeks between them (Tortola Torture and Virgin Gorda Half Marathon) so this race was really important to keep on the game." With some many races on Tortola and Virgin Gorda to choose from, staying healthy is everyone's goal. Stoby, however, runs in all of them. "I know when to push and when not to, but, it's wonderful just to be running and keeping fit all the time," he pointed out. Mays on the other hand, described herself as 'pathetic' and not really competitive. "I wish I was, but, I always just think that's I'll do it and see how I do and then three quarters of of the way, maybe I can do this, so I'm trying to find that little element. I think Reuben's got it." Final results; Male: Reuben Stoby, 41 minutes and 53 seconds. 2. Julius Farley, 43:28. 3. Curwin Andrews, 48:47. 4. Brian Davis, 50:21. 5. Adrian Dale, 51:32. 6. Zebalon McClean, 52:35. 7. Ishwar Persaud, 52:59. 8. Gabriel Obregon, 55 :05. 9. Marlon Felix, 55:29. 10. Gus Faller, 56:41. 11. Patrick Ormond, 56:47. 12. Mahinda Ratnayake, 58:24. 13. Dennis Versoza, 59:53. 14. Aaron Gardner, 1:00.11. 15. Damien Parry, 1:02.31. 16. Teejay Torres, 1:05.37. 17. Andy Miller, 1:13.55. 18. Dan Starling, 1:17.59.